I remember the first time I had a plantain. It was about 7 years ago, we were vacationing in Boca Raton. We were staying at this fantastic resort and had a cabana for the day complete with a crib for Lily she was around 9 months at the time. I don’t know what it is about being out in the sun and swimming that makes me want to eat everything in sight but it does. I decided to order a plate of guacamole, yuca, and plantains. The thing is at the time I thought I didn’t like guacamole, and I had never tried yuca or plantains, but at that moment it all looked great! I devoured it and I was in love. Now it is rare that a day goes by that I do not eat an avocado and almost every week I make plantains. They are so easy to make and are delicious. You can make them sweet or savory. Most of the time I go with savory, although they are fantastic either way. I love to have them when I make rice, black beans, and guacamole. Don’t forget the hot sauce. That is a perfect meal to me! Delicious and healthy savory plantains! Preheat the oven to 415 ºF. Peel the plantain, then cut the plantain in half and then cut each half into fourths. Put the plantains in a bowl then pour the coconut oil over them. Add the garlic, salt and pepper. Toss them all together. Put the plantains on a baking sheet (I line mine with foil to make cleaning up easier). Bake them for 23 minutes, turning them halfway through. Enjoy! Plantains are great by themselves as a side dish or with salsa or guacamole. I love summertime and the abundance of fresh blackberries and blueberries! My freezer is now stocked up with frozen berries but I kept some out so I could make a cobbler. I have been craving one like crazy and I knew I wanted to make it dairy free. This recipe has zero dairy and zero refined sugar. The breading on top of the cobbler is absolutely delicious and the berries offer the perfect sweetness! Enjoy!! A delicious summer time treat using blackberries and blueberries! Dairy free and No refined sugar! Preheat an oven to 375ºF. Lightly grease a 2-quart baking dish. To make the filling, in a bowl, gently toss the berries with the sugar, flour, lemon zest and salt until blended. Pour into the prepared baking dish. To make the topping, in a bowl, stir together the flour, sugar, baking powder, cinnamon and salt. In another bowl, whisk together the egg, coconut milk, coconut oil and vanilla until well blended. Pour the egg mixture into the flour mixture and, using a rubber spatula, fold gently until the flour is moistened and the mixture forms a soft dough. Drop heaping spoonfuls of the dough onto the fruit, spacing them evenly; the dough will not completely cover the fruit. Bake until the filling is bubbling, the topping is browned and a toothpick inserted into the topping comes out clean, about 45 minutes. Serve warm or at room temperature. Great by itself or topped with dairy free ice cream or coconut whipped cream! What do you do when you have an extra bunch of super ripe bananas sitting around…you make banana bread of course! My 2 girls request banana bread all the time so I have played around with making it lots of ways. This one is definitely a keeper. It is delicious, dense but still fluffy and moist and just sweet enough. Perfect for a quick breakfast in the morning or an afternoon snack when you get the munchies. I love using coconut oil with this recipe and the coconut palm sugar is a healthier alternative to brown or white sugar. 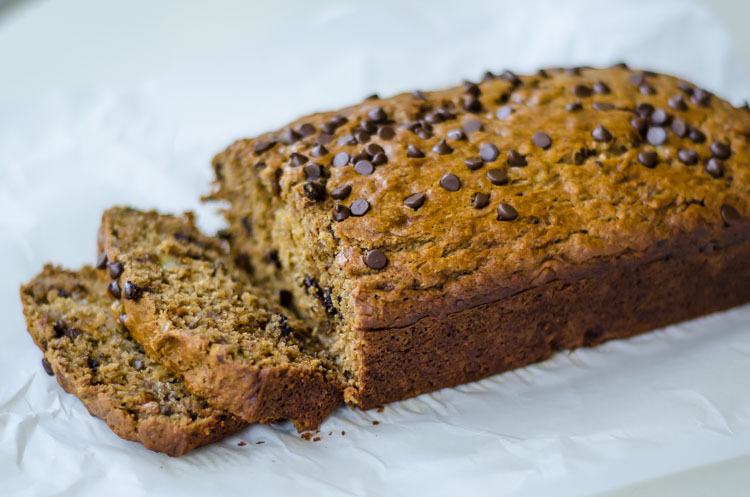 A delicious dense, moist, and perfectly sweet banana bread. Made with healthy ingredients! Whisk egg in a separate bowl, then add to bananas. Add sugar, vanilla, baking soda, and salt to bowl. Then add flour and chocolate chips. Pour into loaf pan and top with reserved chocolate chips. Is anyone else as excited about Fall as I am?? I cannot wait for the leaves to change and to feel the crisp cool air! Not to mention all the delicious pumpkin recipes!!! I’ve recently discovered coconut flour and have started baking with it like crazy around here. I’m honestly sad that it took me so long to try it. 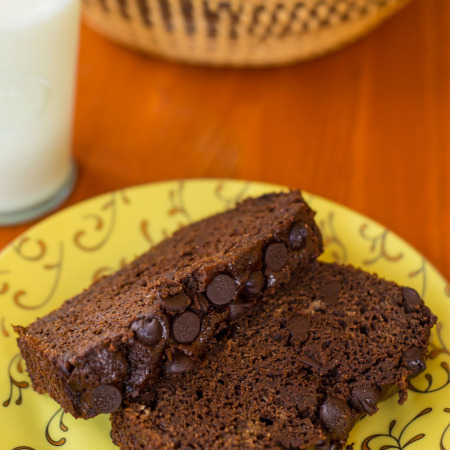 It is such a great option if you are looking for a healthy, delicious, grain free (gluten free) baking option. If you have never baked with coconut flour then I urge you to try this recipe, it will truly open your eyes to how easy it is to bake with out using wheat or other grains. I always look forward to this time of year so I can bake pumpkin breads, cookies, muffins etc…. and this is the first time I’m doing it using coconut flour. These muffins came out great. Pumpkin + Chocolate is the best combination. The texture is so fluffy and perfect….